Tested to extremely high temperatures - 600°C. 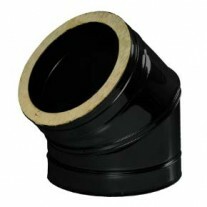 Twin wall flue pipe 1 metre in length A locking band is required. 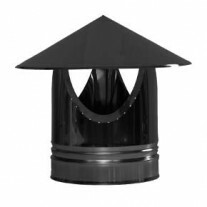 Twin Wall Insulated Chimney parts are secured together by using a Locking Band (sold separately). Make sure that you keep a distance of 60mm from the outside of the flue to any combustible material (wood, plaster board). 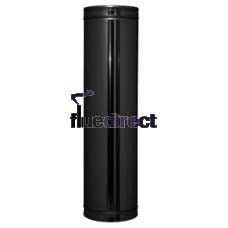 Twin wall flue can be installed internally or externally For use on solid fuel and gas/oil appliances. eg: woodstoves, gas coal effect fires, oil boiler and any solid fuel appliances. Outer skin is made from 304 grade stainless steel. Inner skin is made from 316 grade stainless steel. Insulation is compressed Rockwool. Distance to combustibles is 60mm. 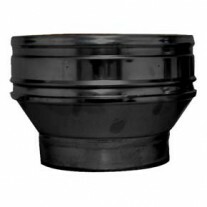 HETAS Approved and is CE marked. 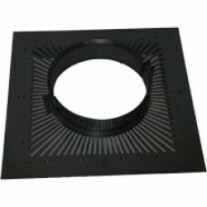 7" inch Black twin wall Wall Support 80-130mm - 175 . 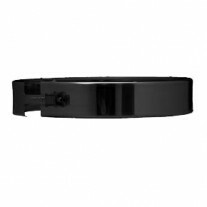 The URL of this page begins with https:// - this means that the page is hosted on a secure server and all transactions taking place are encrypted, so your card details are protected. SagePay's online payment system is the most sophisticated available. All financial transactions are processed securely behind protected firewalls, allowing us to safely process your card payment with the bank. Financial details are never left unencrypted on any part of our system, and are never sent by Internet email.